Days of going to the video store to rent movies have long been a thing of the past. Movie chains and mom-and-pop shops have all but evaporated, replaced by rental kiosks and streaming platforms. While it is fairly easy to track down what you want to see with a little internet savvy, what do you do when there is no watchable digital version? More importantly, what do you do if your celluloid obsession was never even digitized? It’s a scary thought, I know. Sadly, many films released on VHS will never see a release in another format. They were either not in high enough demand or were deemed unworthy of a DVD/BluRay sibling. Some of these formats are the last documents of an idea; a history threatening to accumulate dust. If you happen to find a place with VHS (or Laserdiscs, Beta Tapes, CED Discs), take an extra minute to peruse their offerings because there may be gems hidden amongst the surplus of Titanic and Austin Powers tapes. On a dig in our Midtown location, we surfaced these three treasures. Can you imagine what else is available at the other Bookmans stores? If a sundae needs a cherry on top, Body Rock is the wet, neon fruit adorning the ’80s hip-hop dance film craze. There are absolutely better movies in the genre but none of them are as feverishly entertaining as this Lorenzo Lamas showcase of rapping and breakin’. Lamas plays Chilly D, a hunky, rough roustabout whose ripped jeans match his tough street attitude. He pals around with a crew of taggers and tries to dance. Honestly, it’s pretty damn watchable. One day, Chilly gets a huge opportunity in the form of a residence at THE HOTTEST DANCE CLUB EVER. If you’re having trouble setting the scene, picture improbable fog rolling under a never-ending synth dance beat. You can almost smell the inevitable perfume of cocaine and body odor generated by the teaming bodies crammed inside. It is here that Chilly takes the stage where he’ll dance fight Day-Glo mummies and gyrate atop skyscraper-sized boom-boxes. Cyborg Cop chugged the wake of Terminator 2 and Universal Soldier to the tune of a direct to video knock-off release. David Bradley stars as ex D.E.A. agent Jack Ryan. This Jack Ryan is not to be confused with Tom Clancy’s, but if that helps you enjoy the movie… have at it. Jack Ryan roundhouses his way through seedy bars, morgues, tropical breezes, and intrigue while tracking down his missing brother. Also, there are cyborgs with knife fingers and a pre-Sliders and LOTR John Rhys-Davies. David Bradley also sports a leather fanny pack during the whole film. I’m not making any of that up. If you hadn’t already been following the story of the two formerly-conjoined twin brothers Duane (not deformed) and Belial (very deformed) on their murderous jaunts from Basket Case and Basket Case II, then Basket Case III may be a doozy for you. 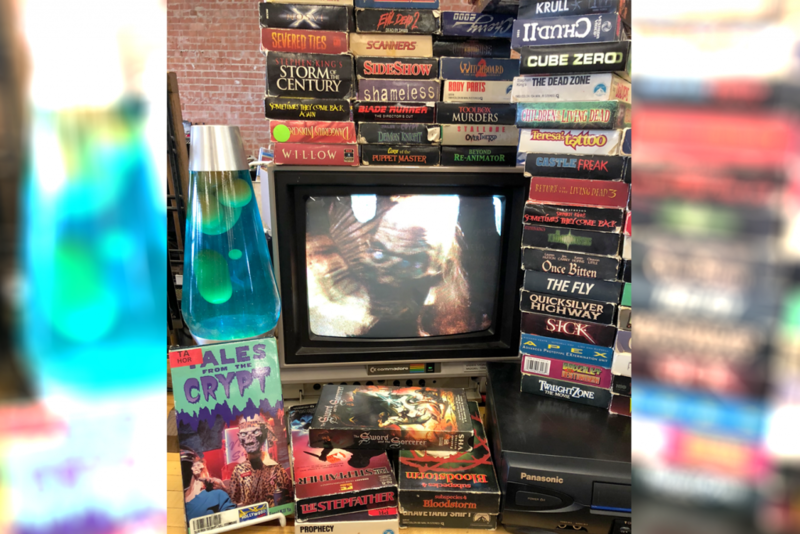 Don’t worry – you’ll be lost in the action of Basket Case III that you’ll only need to know the basics to make this movie night an epic one. The twins were separated against their will because Belial was deemed a monster. But brotherly love and a wicker basket are stronger than parental disapproval. Together, the pair painted the town dead across two films, bringing us to the third installment. Director Frank Henenlotter (Frankenhooker, Bad Biology, Brain Damage) takes fans on the wildest Basket Case ride yet. This go around, the boys find their telepathy dwindling (because of course, they are telepathic). To keep the good fight going, they join a traveling posse of unique deformed individuals, take on a gaggle of Podunk cops, fight in a mech suit, and still have time for Belial’s girlfriend to have a litter of children. The trilogy wraps up like a ferris wheel off its hinges rolling through a crowded concession stand. It’s a flashy chaotic mess that sticks with you long after the tape stops rolling. The next time someone tells you that VHS is dead, you remind them that there are some true gems alive and kicking in those stacks of cassette tapes. Make your VHS section bigger.